Choices are best understood by those who make them. 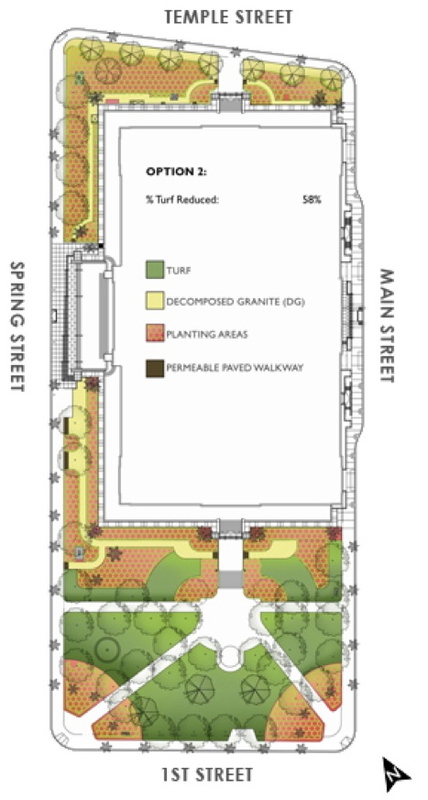 In the case of the decision about where to unveil schematic drawings of what new landscaping around Los Angeles City Hall might look like after last year’s Occupation, it may only be comprehensible to city hall’s caretakers at the Department of Recreation and Parks. 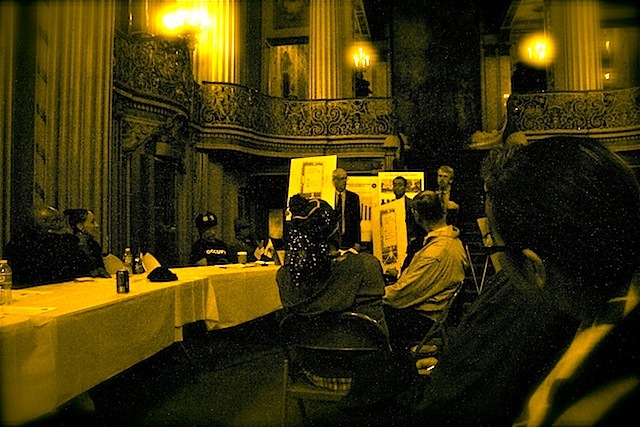 Choosing last night’s meeting of the Los Angeles Downtown Neighborhood Council was, procedurally, rather like the federal government unveiling new plans for the White House grounds at a meeting of a DC neighborhood association. LA supports 15 council districts and an estimated 90-plus neighborhood councils. An internationally recognizable symbol for most of the city’s 500 square mile reach could be a gushing lawn sprinkler. Depending on the location from cool coastal spots to hot valleys and foothills, from 40 to 70 per cent of our largely imported water is used outdoors. How fast and how seriously Los Angeles embraces water conservation is integral to the ultimate success of the city in the coming era of population growth and climate change. If there is a single community that has the least understanding and the least at stake to do with landscape reform, it is the loft and apartment dwellers who comprise the Downtown Neighborhood Council. They live in one of the rare corners of the city free of what Joni Mitchell described as “the hissing of summer lawns.” One joked last night about attendees from the San Fernando Valley needing a passport. 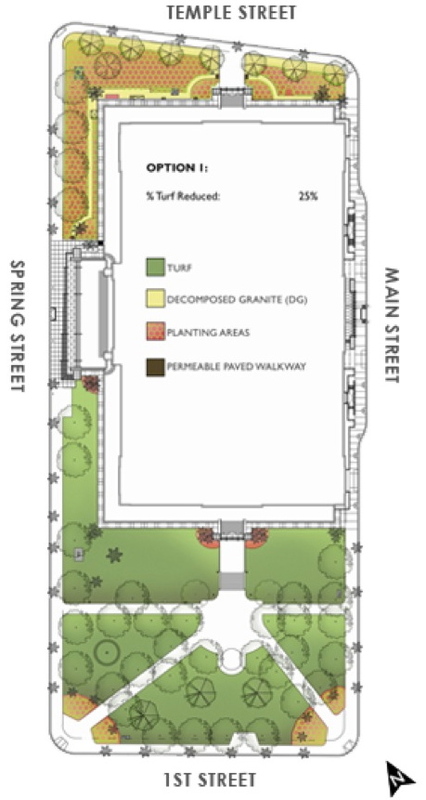 Of the three concepts for a future City Hall garden co-presented by Rec & Parks landscape architect Tom Gibson and planning superintendent Mike Shull, the first reduced water-hungry turf some, the second by about half and the third by roughly 80%. Costs varied from $350K for some reduction, to $750K for half, to “a little bit over a million” for 80% turf removal. Projected water purchase savings for the some change, some more change and most change options were one, two and three thousand dollars a year respectively. Suggested yearly maintenance costs were $90, $140 and $180 thousand a year, again respectively. As the costs were stated, e-mails began flying among the attendees. “The last can’t be right!” As any weed can tell us, none of them could be. Water equals growth, growth equals pruning and pruning equals disposal and green waste processing. Or, in other words, a native garden doesn’t need weekly watering much less mowing and routinely irrigated turf does. Come her thirty seconds of comment, Lynette Kampe, executive director of the Theodore Payne Foundation, observed that the putative savings of $3,000 a year for the third plan didn’t take into account the region-wide impact that an inspiring drought tolerant garden would have in a city where lawn irrigation can amount to 70% of total household water use. A representative from the Surfrider Foundation rose to ask why there was no mention of the City Hall garden complying with AB 1881, the state-wide requirement for water efficiency in new landscapes. Melissa Stoller of the Mar Vista Community Council wanted inspiration from the three schematics about how beautiful LA can be that she just wasn’t finding. “I vote for the fourth,” she joked privately. My own question was technical: What will be the requirements be under the California Environmental Quality Act? Options one and two, Shull responded, should require no more than a rote filing. The third option, the driest and most sustainable, might trigger an environmental impact review. Not that this is in any way the fault of Rec & Parks and that nice Mr Shull, but this would be a scandal worthy of a visit by 60 Minutes. CEQA compliance was waived for a downtown AEG stadium that may devastate Pico-Union and bring the Harbor Freeway to a standstill, but Rec & Parks might not be able to remove 80% of the turf around City Hall without it? This post was lightly edited on 1/12 after being published 1/11. Links of related articles were added, a reference to water use in native vs conventional gardens was clarified and an explanation of the climate zone component to water use statistics was added. They (We) should go native and plant NOW! This is our city and these folks are using our tax dollars to perpetuate unsound practices. Instead, can we please have models from our public agencies that help set new standards of sustainable beauty? The ‘cost’ of water as cited by City Hall is fake – the water is heavily subsidized and the actual cost, economically, ecologically, and socially, of using that water to irrigate useless lawns… is huge. Do these people not realize that the Sierras may face one of the lowest snowpacks on record this year, if the weather pattern doesn’t drastically change? Even if it does we will probably be well below average. It’s not the ‘cost’ of water but the environmental responsibility of using less that should be driving this decision. Oy vey! It should be so simple. Bureaucrazy (it was a typo but boy, does it fit) at its worst. The link for option 2 shows option 1. It’s not clear that one can make an informed decision about a preference based on a plan view picture alone. I hope some artists concepts from a standing perspective were presented to the audience: The tree placement is identical in all plans, so far as I can tell. Maybe the tree selections vary. The large DG area in option 3 brought to mind a boule court. Wouldn’t it be refreshing to meet your councilman for a friendly game of boule? Thanks Brent. Most odd about the enlargement of 2 showing up as 1. The site just had its molecules rearranged in a change of host. Will check other images. Went in and reloaded the images on this post and they’re magnifying correctly now. The trees will remain the same because the City regards the ficus trees as sacrosanct. There were no elevations presented, though there may be more drawings when the plans are shown to the Arts, Parks and Neighborhood Committee on January 25. I’ve always wanted to learn how to play boule.